A large part of delivering a successful digital project is also having the opportunity to choose a supplier that fits with your team’s work culture. A big chunk of my job is to make sure that all of the above happen. I’m Gemma. I head up engagement on the Digital Marketplace. This is a service that helps government and the wider public sector find suppliers with the right technology and people at the right price. The buying process works in cycles, or iterations of ‘frameworks’. Each framework is replaced every 6 to 9 months. When services on the Digital Services 2 (DS2) framework became available in August 2015, government buyers had access to 169 suppliers. We knew this didn’t meet the user need as well as it could, partly because government buyers didn’t have a very diverse pool of suppliers to choose from. Most of the suppliers were based in London, too. To make things better we made lots of changes. In fact, we designed an entirely new framework. When the Digital Outcomes and Specialists framework replaced DS2 in April 2016, the supplier statistics showed there were 1,261 suppliers, and 52% of them were new to the Digital Marketplace. They are also spread more widely around the UK. The image compares the spread of DS2 suppliers with the spread of Digital Outcomes and Specialists suppliers. On the Digital Marketplace blog we talked a lot about how we were encouraging suppliers to apply to sell their services to government, by making things simpler and faster for suppliers. For example, we’re simplifying the way suppliers apply to a framework and we’ve reduced the volume of legal documents by half. However, having a strong engagement plan was also really important to increase the number of suppliers and their diversity. For Digital Outcomes and Specialists, suppliers can provide services in 4 different categories. We started by working out which communication channels we could use to reach suppliers that sell services in these categories. We plotted it onto a matrix. We worked with business and technology communities around the UK to hijack their communication channels, like Twitter, email newsletters and blogs. 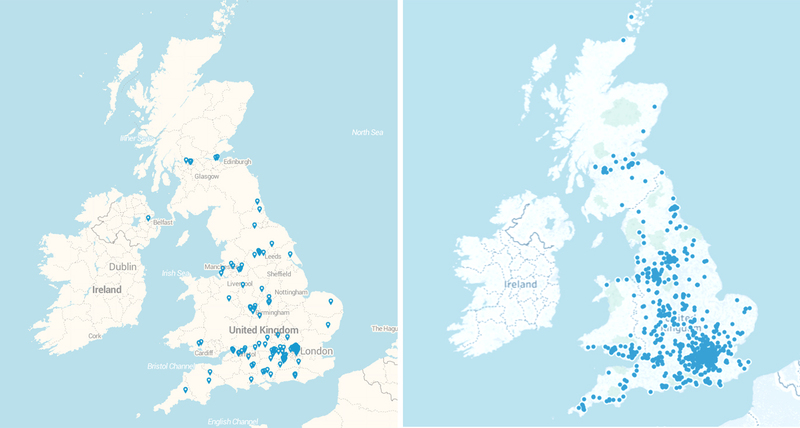 We teamed up with specialist and local communities such as SW Innovation, CodeClan and ScotlandIS, as well as larger communities including techUK, EuroCloud and The Federation of Small Businesses, which have widespread members around the UK. Through them, we reached suppliers that were eligible to be on the framework, kept their members up to date with our progress and let them know they could apply to supply their services to government. Looking at the analytics, we identified notable spikes in traffic to the Digital Marketplace service in line with our engagement activity. We ran 2 events to talk about the progress on the Digital Outcomes and Specialists framework. We publicised the event widely through the tech community, which lead to more than 300 suppliers attending from across the UK. The events were useful in 2 ways. Firstly, we used the feedback we gathered to help design the framework. Also, by holding the events, we told lots of people that we’re working on something that they could and should be using soon. In the end, suppliers created over 3,000 accounts on the Digital Marketplace so they were ready to apply to supply their services to government when applications opened. The supplier base is increasing and diversifying with each new framework on the Digital Marketplace, but there’s still more work to be done. We want to engage and educate buyers in both central government and the wider public sector – at the moment, local government and the wider public sector only contribute around 23% of the spend that goes through the Digital Marketplace. Councils and wider public sector organisations work hard to deliver a better deal for taxpayers but there’s potential for even greater value for money if they use the Digital Marketplace. It’s important that we offer support and education so the benefits of using the Digital Marketplace are felt as widely as possible over the public sector.